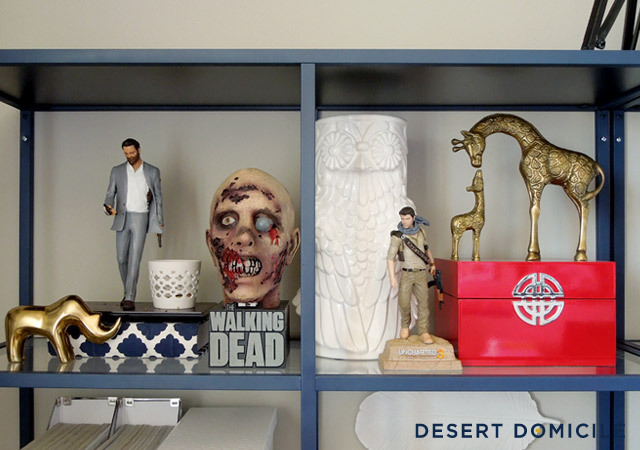 Thank you for all of your sweet comments on our styled office shelves. You guys are too kind! Reminder: I'm not an expert in styling (far from it) but like anything, I'm getting better and better at it the more and more I do it. Practice makes perfect, right? 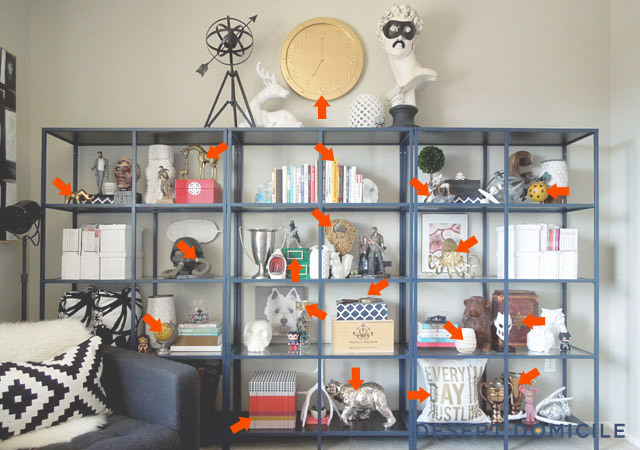 Styling a lot of shelves can be overwhelming when you're looking at the big picture AKA all of the shelves at once. To make things easier on myself, I started styling our shelves by getting one shelf "finished", followed by another knowing that I could always go back and tweak things. Not only did I work in chunks, I also worked in "full" and "broken" mode. I don't think this is an actual thing (again, I'm not an expert) but I wanted every other shelf to be full, meaning the objects would span the whole shelf (even behind the middle bar). 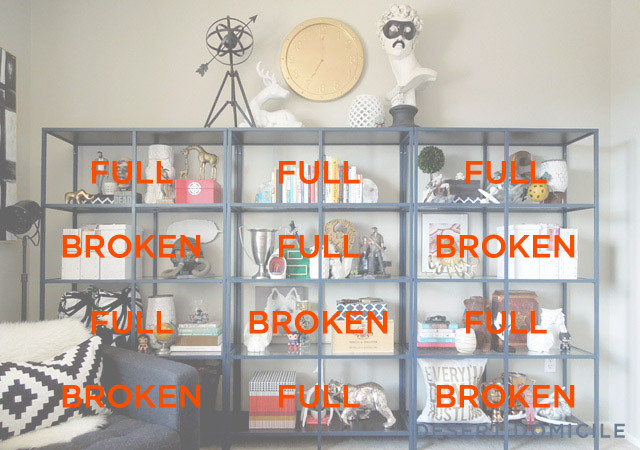 I wanted the other shelves that weren't full to be "broken", meaning the objects would be mostly confined to their side of the middle bar. 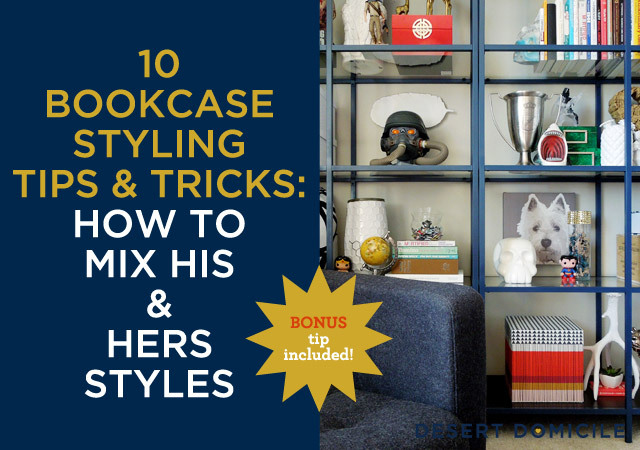 For me, this method helped our bookcases look less chaotic and gave me space to work in some of my larger decorative items without overwhelming smaller ones. 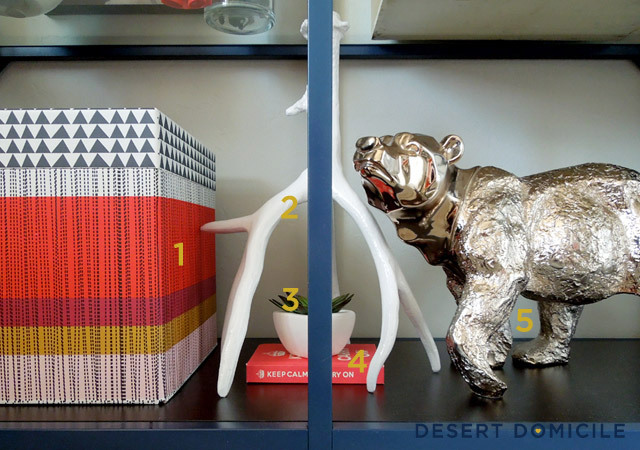 Color balance is important because without it, your styling (or gallery wall, or overall room arrangement) can end up looking lopsided – colorful on one side, not so colorful on the other. I've washed out the photo above so you can see the arrows that point to a gold or gold-toned object. I repeated the same color throughout the shelves to help keep everything balanced even though all of the objects are so different. Red is also repeated in a few places like the box on the top left shelf, the books on the top middle shelf, the shark's mouth on the top-center middle shelf, the box on the bottom shelf below the shark, the agate slice photo behind my octopus, and in the box next to the monkey below my octopus. I've said it before and I'll say it again, when you're styling anything, the last thing you want is for your eye to stop on one area because that means some of your hard work isn't being seen. I added some dotted lines to the photo above to show how my eye moves across each object and onto the next one. I try to form my groupings into little mountains where each one has a couple of lower parts with a peak tossed in here and there. This approach helps pull your eye up, down, and across the entire arrangement. In order to keep our shelves from taking a turn towards crazy town, I made sure to include some symmetry. See the book stack with the car on top + the vase + the monkey above? 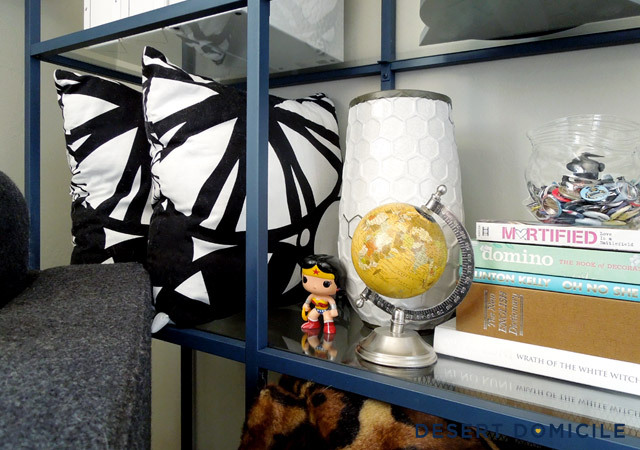 Notice how I have another book stack with the zipper bag on top + the globe + the beehive vase in the photo below? The arrangements aren't identical but they are symmetrical. 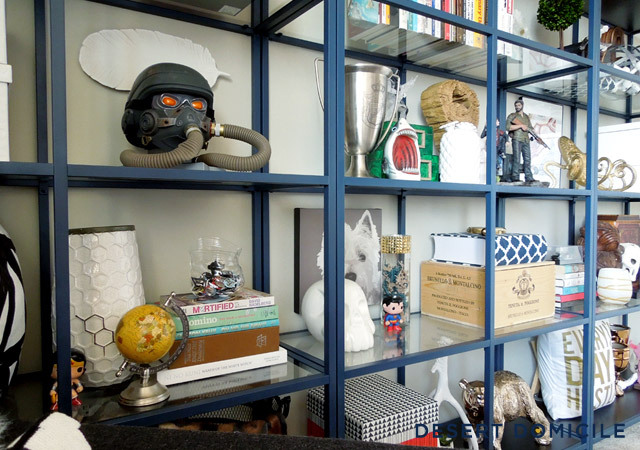 Both sides of our bookcases also have two magazine holders and two white storage boxes on them which you can see peeking out of the top left of the photo above. 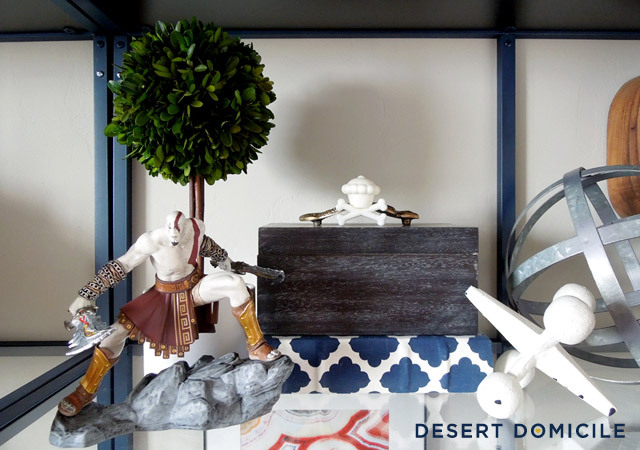 When I first started styling our shelves, I wasn't sure how I was going to mix my boyfriend's things in with mine because they're so different. 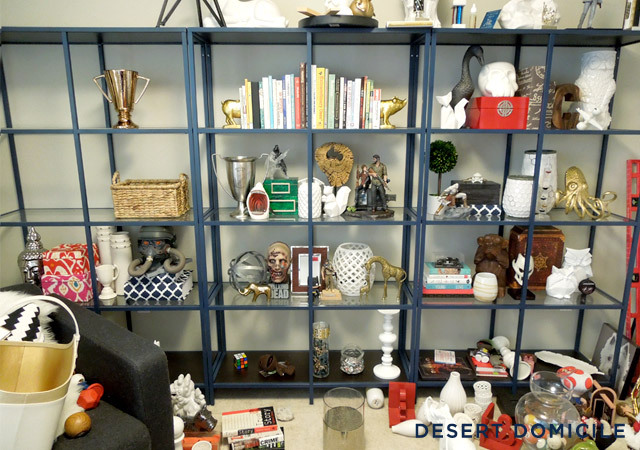 I didn't want to group all of his things together in one area so I tried to incorporate one or more pieces from his collection in with a few items from mine. 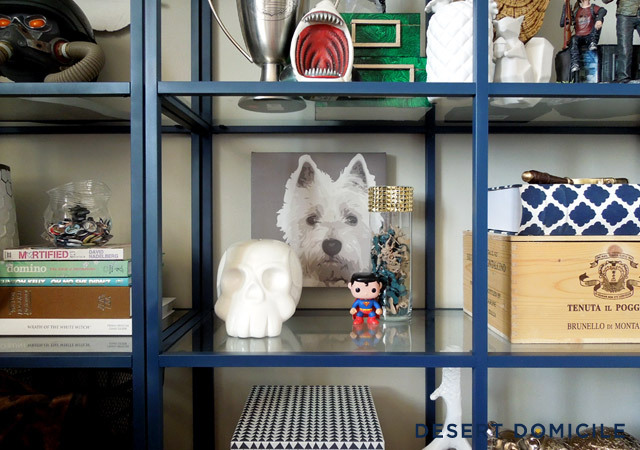 This helped maintain a happy balance across all of the shelves and also avoided the divided look that can happen when you have too many of one person's things on one side and not enough on the other. The photo above was taken during my chaotic styling progress. The entire right shelf felt way too heavy to me so I rearranged some things and edited out some others until I liked what I saw. Odd numbered groupings are easier on the eyes because they give them a place to rest. They're also more interesting than even numbered ones. If you can, group your objects in 3's, 5's, 7's, 9's etc. I hung three different items on the wall behind my bookcases to give the overall arrangement some extra height and interest that I couldn't achieve by stacking things on top of one another. 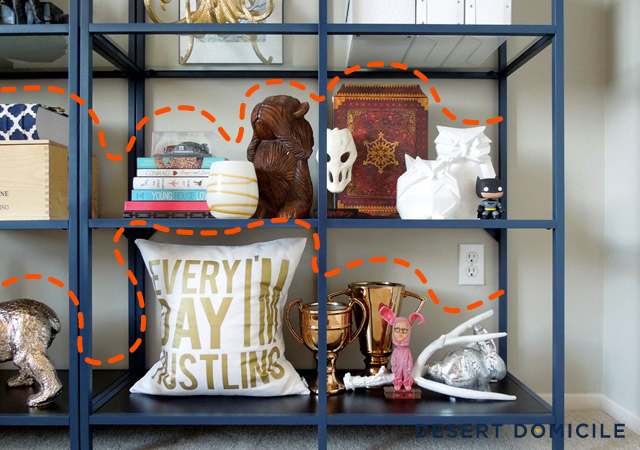 If your bookcases aren't open like mine, you can still hang things on the back of them! If you're worried about damaging the backing material or don't think it can support the weight of a hanging object, try painting or stenciling the back instead! 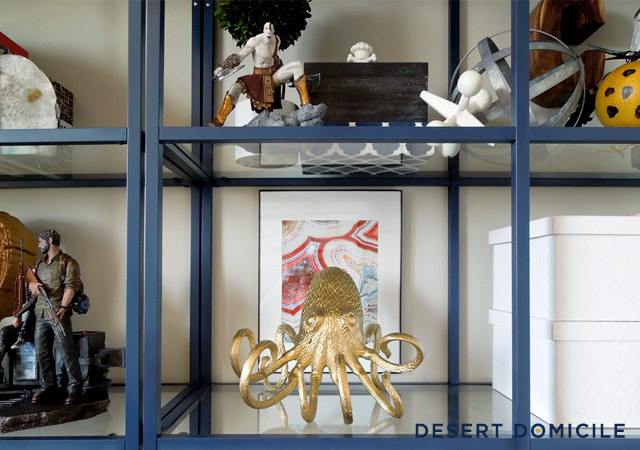 This may seem like an obvious tip but sometimes people forget that meaningful items are more interesting than non-meaningful ones because they might not want personal, "non-pretty" things out on display. 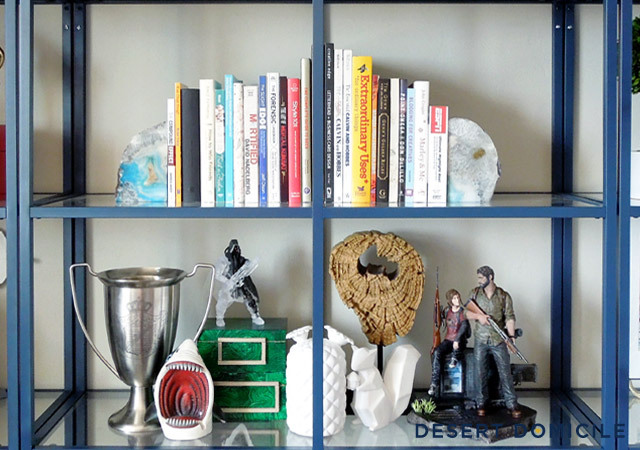 Sure you can run out to HomeGoods, Target, or even IKEA to buy a bunch of stuff to fill your shelves with but they won't have nearly as much meaning as they would if they were filled with things you love. You are seriously a styling prodigy! And I have a feeling our men would get along SO well. Nerds unite! WOW!! Some great ideas...My wall unit is in my craft room and so I attempted to do some paintings on canvas and put it up against the back to give it some color...just an idea!! On the side walls I inserted some corkboard so I can dry my stuff or stick some pictures or drawings that the grand-kids did...looks artsy!! LOL! Hi!! I'd love to know what shade of blue you used to paint your bookcase!! It's a beautiful project. Thanks for sharing!! Hi Sonal! 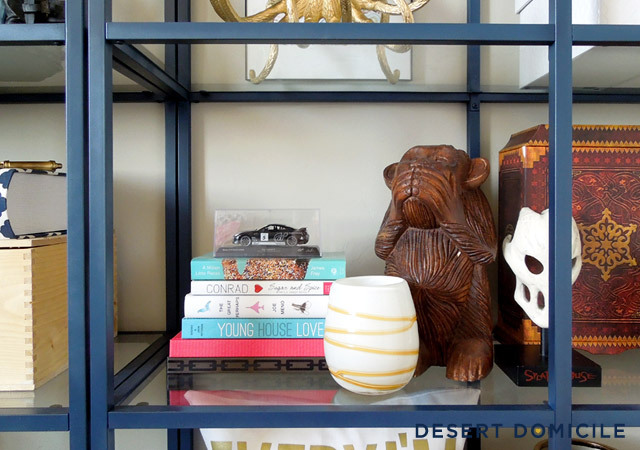 I used Valspar's "Indigo Streamer" spray paint in a satin finish to paint my shelves. I love this! Exactly what I needed. 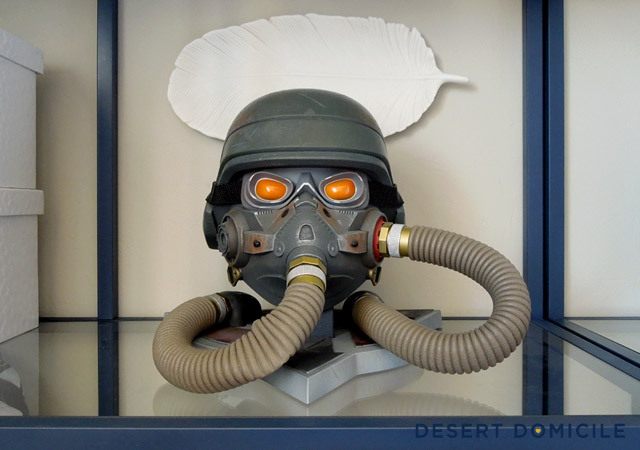 I'm revamping my bedroom at the moment and wanted to go for a subtlety geeky style, mixing in my interests to the decor without it looking too obvious. The balance you have managed here is a definite inspiration!